The 1992–93 NHL season was the 76th regular season of the National Hockey League. Each player wore a patch on their jersey throughout the 1992–93 regular season and playoffs to commemorate the one hundredth anniversary of the Stanley Cup. Twenty-four teams played 84 games each. It proved, at the time, to be the highest-scoring regular season in NHL history, as a total of 7,311 goals were scored. Twenty of the twenty-four teams scored three goals or more per game, and only two teams, the Toronto Maple Leafs and the Chicago Blackhawks, allowed fewer than three goals per game. Only 63 shutouts were recorded during the regular season. The Montreal Canadiens won their league-leading 24th Cup by defeating the Los Angeles Kings four games to one. 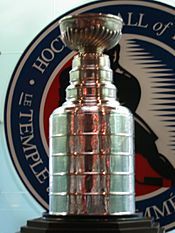 As of the end of the 2007–08 season, this is the last time that a Canadian team has won the Stanley Cup. March 22, 1993: Mark Hardy and Ottawa's 5th round choice in 1993 Entry Draft (previously acquired from Ottawa) traded from NY Rangers to Los Angeles for John McIntyre. March 22, 1993: Jim Hrivnak and future considerations traded from Washington to Winnipeg for Rick Tabaracci. March 22, 1993: Peter Taglianetti traded from Tampa Bay to Pittsburgh for Pittsburgh's 3rd round choice in 1993 Entry Draft. March 22, 1993: Steve Konroyd traded from Hartford to Detroit for Detroit's 6th round choice in 1993 Entry Draft. March 22, 1993: Vancouver's 9th round choice in 1993 Entry Draft traded from Vancouver to Winnipeg for Dan Ratushny. March 22, 1993: Mike Hartman traded from Tampa Bay to New York Rangers for Randy Gilhen. March 22, 1993: Murray Craven and Vancouver's 5th round choice in 1993 Entry Draft (previously acquired from Vancouver) traded from Hartford to Vancouver for Robert Kron, Vancouver's 3rd round choice in 1993 Entry Draft and future considerations. March 22, 1993: Mike Ramsey traded from Buffalo to Pittsburgh for Bob Errey. March 22, 1993: Craig Muni traded from Edmonton to Chicago for Mike Hudson. 1992-93 NHL season Facts for Kids. Kiddle Encyclopedia.